Our flight back to the US did not leave until after 9:30 PM, so we had a full day to enjoy Fiji. Of course we still had to check out well before it was time to leave for the airport but the Hilton has some rooms that are not suitable for overnight guests but are a nice place to lounge until the proper time. 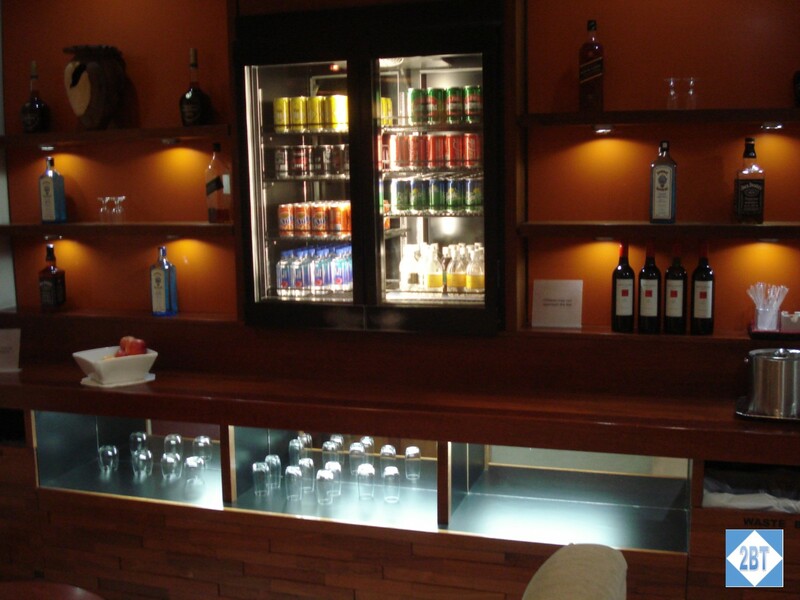 Most importantly they’re air conditioned – something not available in the open-air lobby. I really appreciate that because I don’t want to be all sticky from perspiration when I’m about to fly for 10+ hours! Our driver from Rosie Holidays came to pick us up in plenty of time to get to the airport. 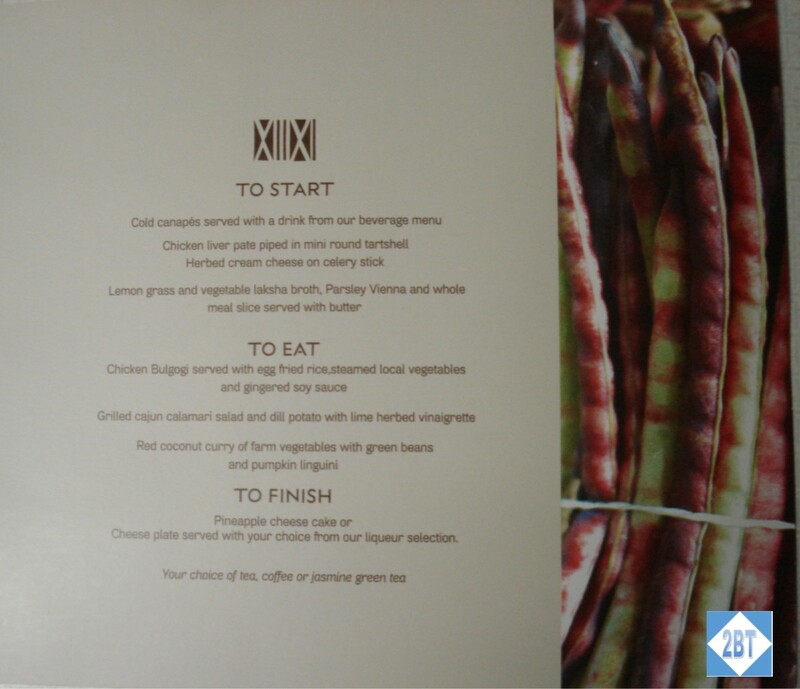 This was such a lovely experience compared to Sunbus in both Sydney and Melbourne. We arrived at the airport in plenty of time for our flight. Since two of us were in business class and there were very few passengers around just yet, the rep at the premium line took care of all of us, which was nice. 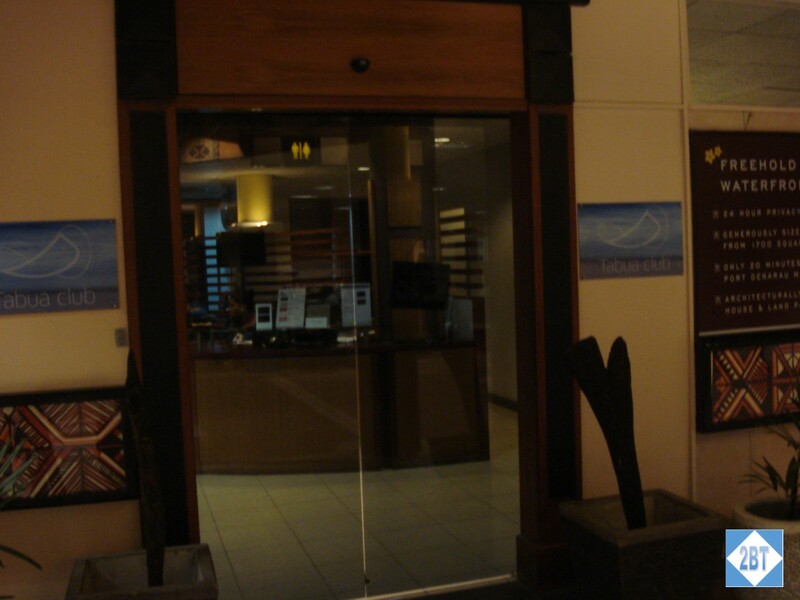 From there we wandered through to the Fiji Air Tabua Lounge. It was quite small but then it didn’t need to be large. 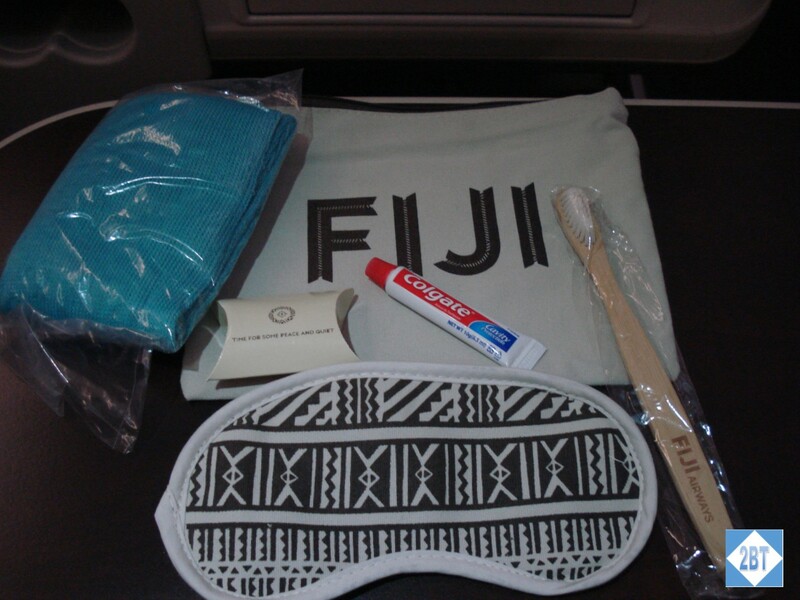 Fiji Air operates only one type of wide-body aircraft, the A330, which has 24 angle-flat seats in business class. There aren’t a whole lot of flights departing that time of night which meant it was mostly the business class cabin passengers. I was able to use my Priority Pass card to guest in my friend who was flying in economy so we were all able to stay together. 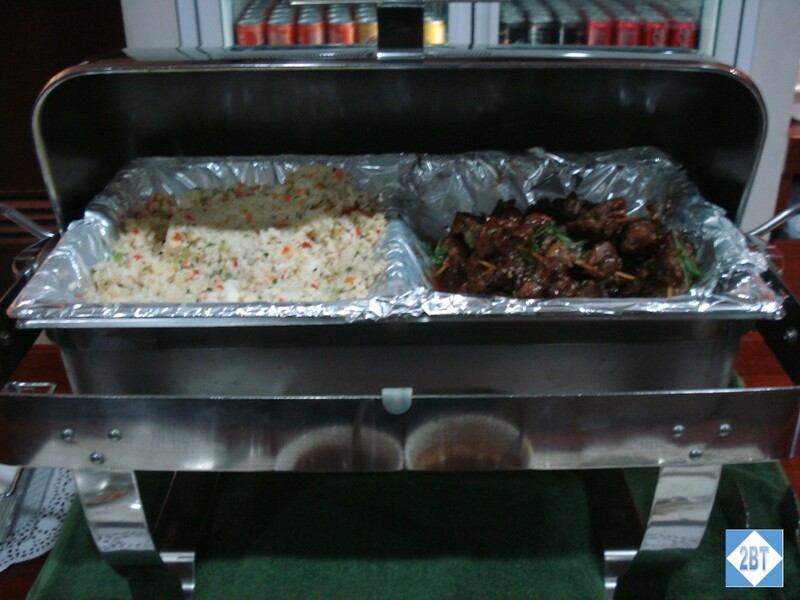 There was a small food selection with meat skewers and rice in the warming tray, some (split pea?) 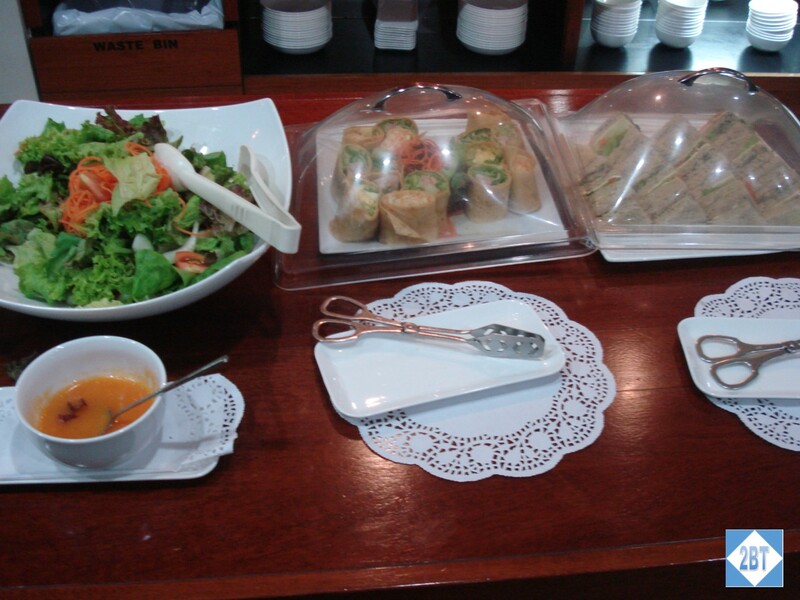 soup, a small salad bowl, and some small-cut wraps and sandwiches. 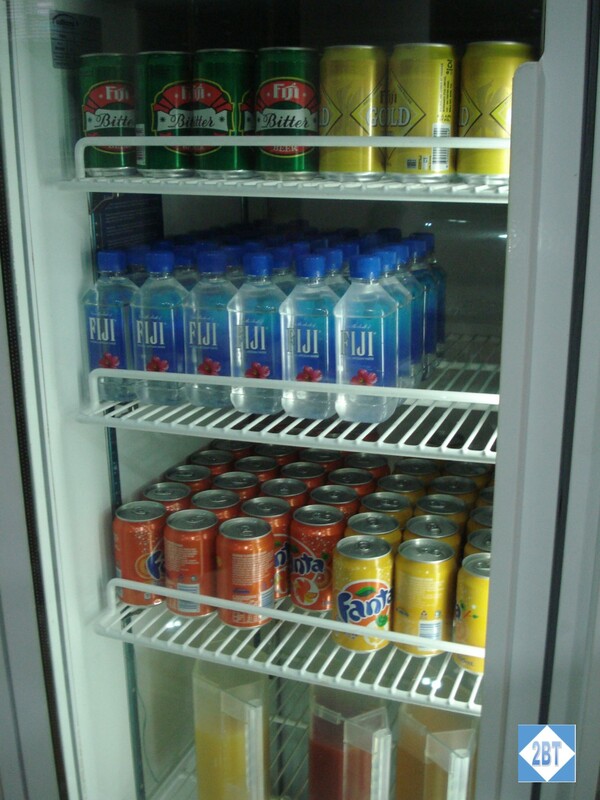 There were a couple of refrigerators with various kinds of cold drinks as well as a coffee machine and even a small bar. There wasn’t a lot of seating but it was comfortable enough. And the air conditioning worked well as did the wi-fi. 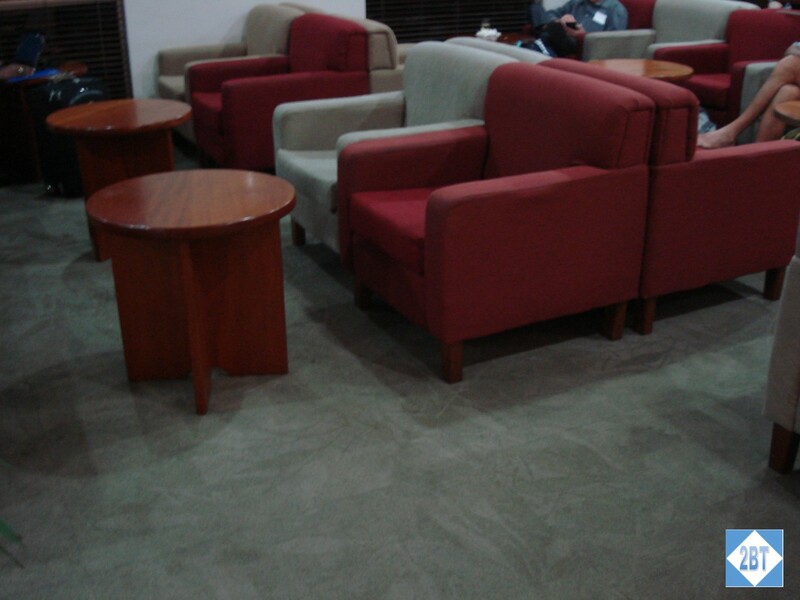 We were in the lounge for about an hour before we decided to head to the gate. We reached the escalator to go up to our gate, only to find it blocked. I’m not sure if this is normal procedure or not but there were lots of people milling about the area. Once business class was allowed up the escalator I noticed that several gate areas were undergoing construction/renovation so perhaps that was the reason the escalators were blocked. And then I heard my name paged. Ugh, I had to go for secondary screening. It wasn’t a big deal but it did push me way back in the boarding queue. That also meant my photos of the cabin were done in a rush. I like the color scheme of the cabin. The cream seats with dark brown accents sounds boring but I think it makes things look crisp. 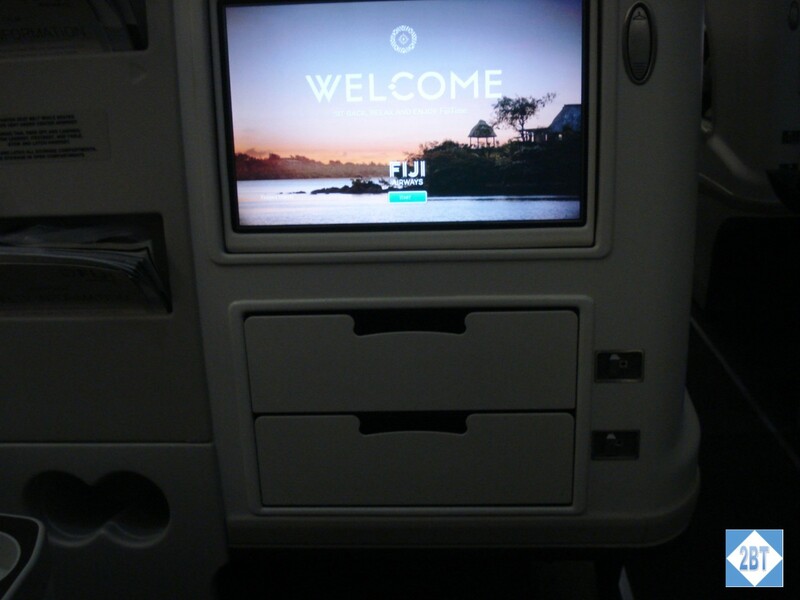 What I have trouble understanding is why Fiji Air selected angle-flat seats for their longhaul flights when the planes were overhauled in 2013. If you want to be a world-class competitor, why select a seat that’s two steps below world-class? On the other hand, they’re the only airline with non-stop flights to the US so perhaps they don’t see the need to provide lie-flat seats. Either way, it’s disappointing but it’s far less time-consuming to fly directly back to the US from Fiji than to connect in New Zealand or Australia. The seating is 2-2-2. I had the aisle while my companion had the window seat. With the cabin already very busy it was difficult to get a good photo of the seats. 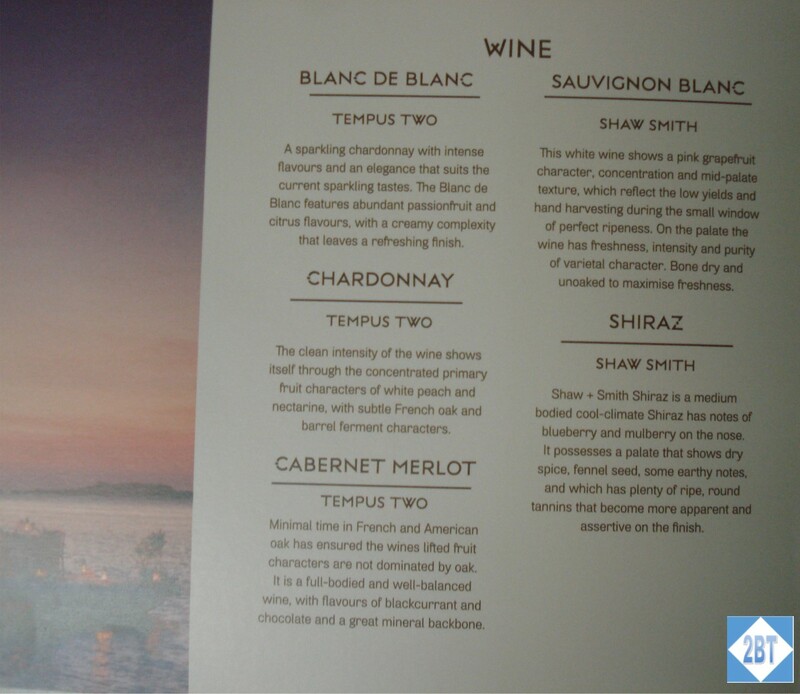 Fortunately the folks at Australian Business Traveler had a sneak peek at the cabins when they were new and have some good photos. Directly in front was the TV screen, which was nice and large. Below that were two storage compartments. 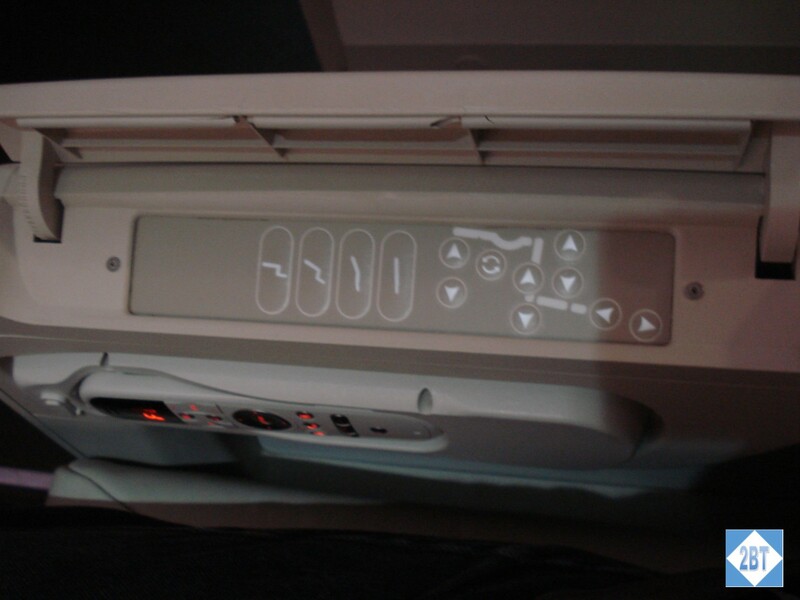 The entertainment controller was tucked into the side of the armrest and was intuitive. 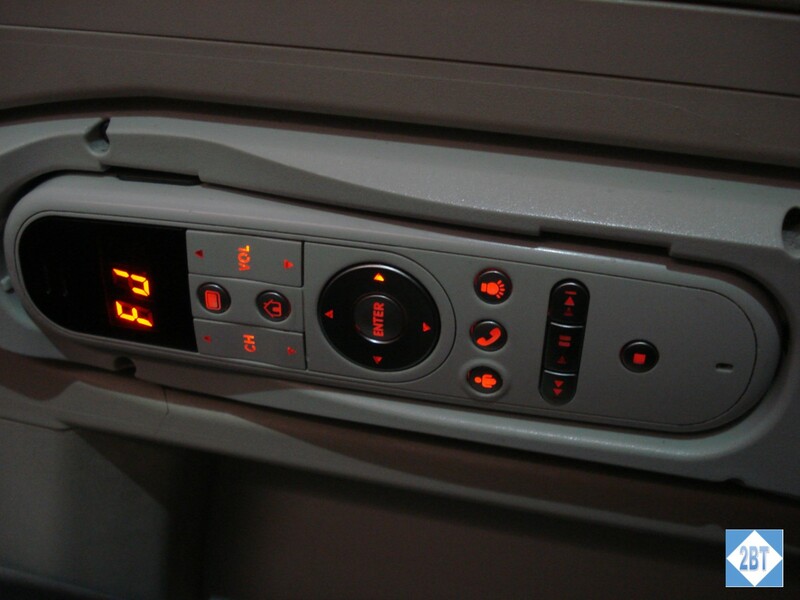 The seat controls were below a flip-up panel in the armrest and were equally easy to comprehend. It had four preset buttons and a host of other controls to allow customization. As for service, well the flight attendants tried. They were mostly friendly but the service just was not polished. 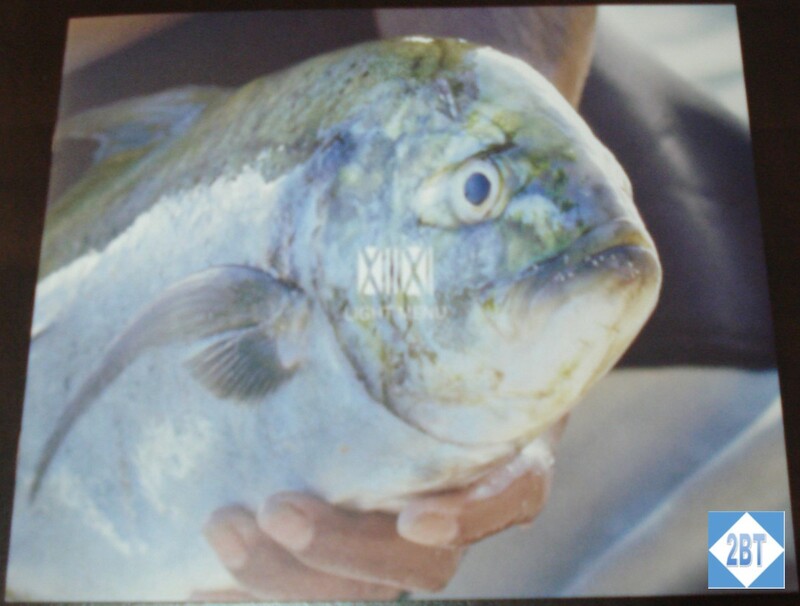 But then, that sort of reminds me of service in Fiji in general. 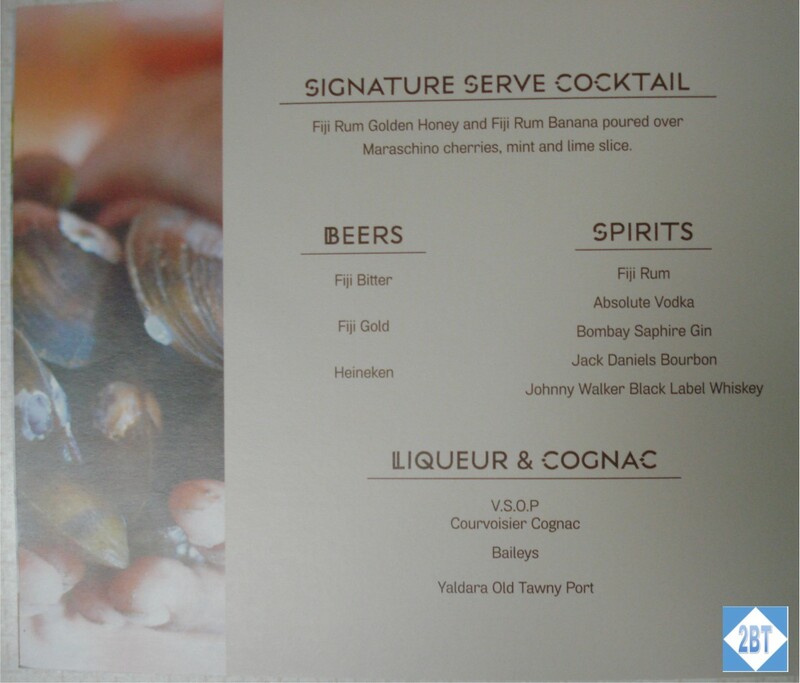 So I’d say the service is very authentic – and that’s not a bad thing at all. 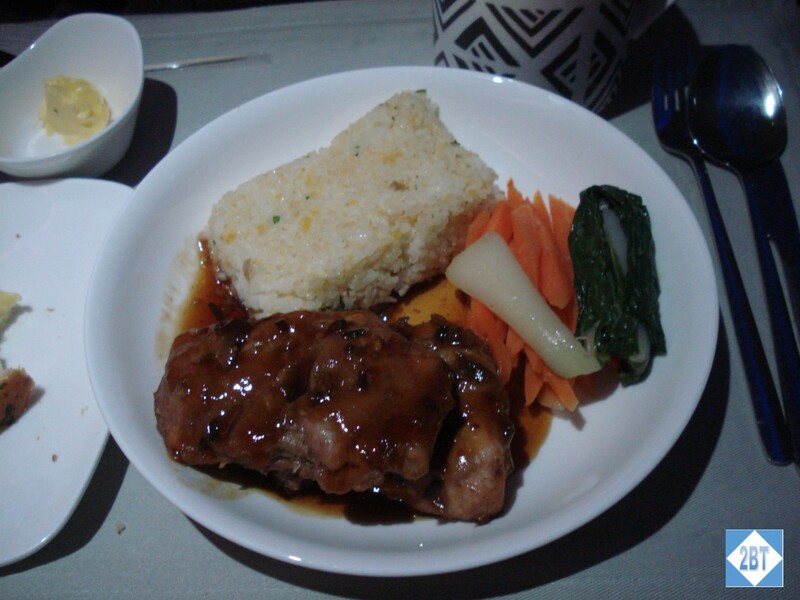 Even though it was well past dinner time when we boarded – and even later than expected as we had to return to the gate to screen some bags that somehow got loaded without being screened – there was a dinner service that began rather quickly after we were airborne. I skipped the appetizers as I just wasn’t all that hungry since we’d had a full dinner at the hotel only a few hours earlier. I knew I needed to eat something so I had the chicken entree and dessert. I don’t recall it being spectacular but it was edible though I seem to recall it was a bit fattier than I prefer. The presentation could use a little work though. Seeing the fried rice served as a rectangle felt a bit industrial. 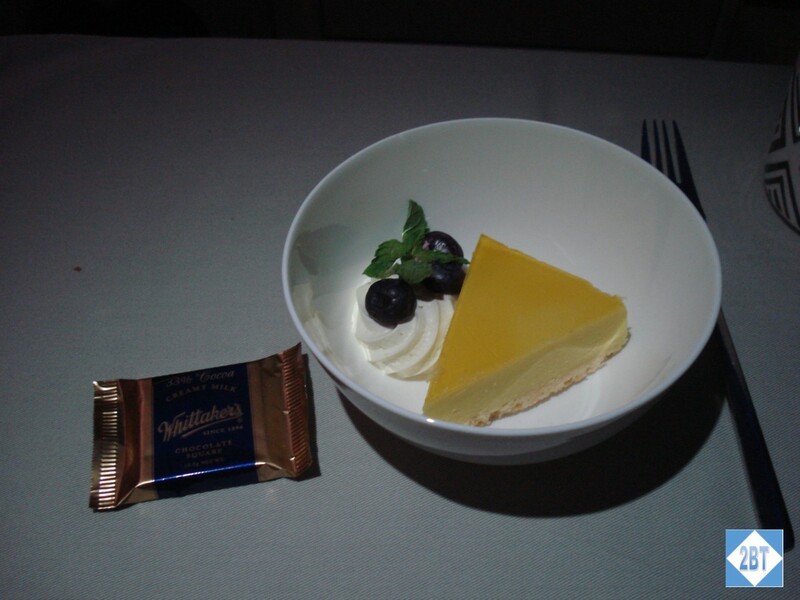 I’m not a huge cheesecake fan but did have the pineapple cheese cake and it was quite good. I’m always disappointed when there’s not a chocolate option for dessert but at least they provided a few bites of chocolate to top everything off. The amenity kit was packaged in a small cloth bag that, again, seemed very authentic. 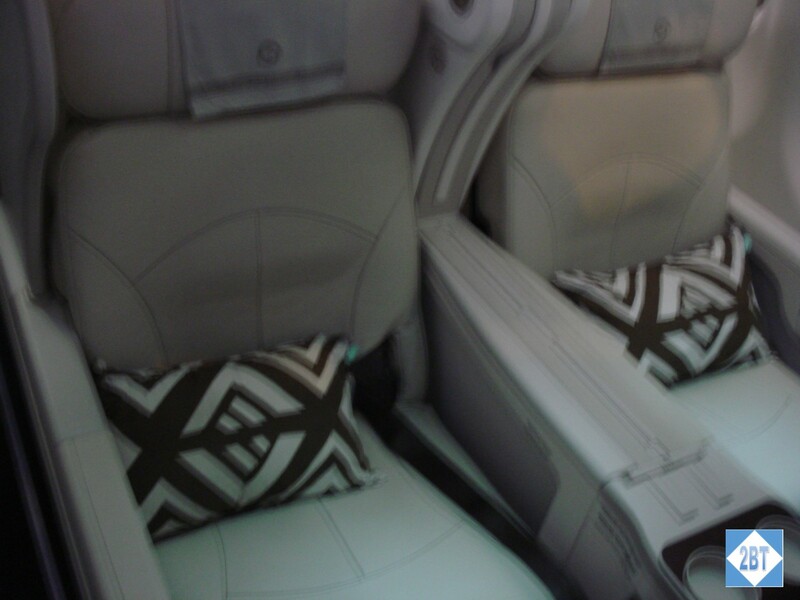 No plastic or faux leather for Fiji Air! It contained a sleep mask in the same pattern as on the pillows, socks, earplugs, a wooden (!) toothbrush and toothpaste. Before we turned in for the night we filled out cards with our breakfast orders. 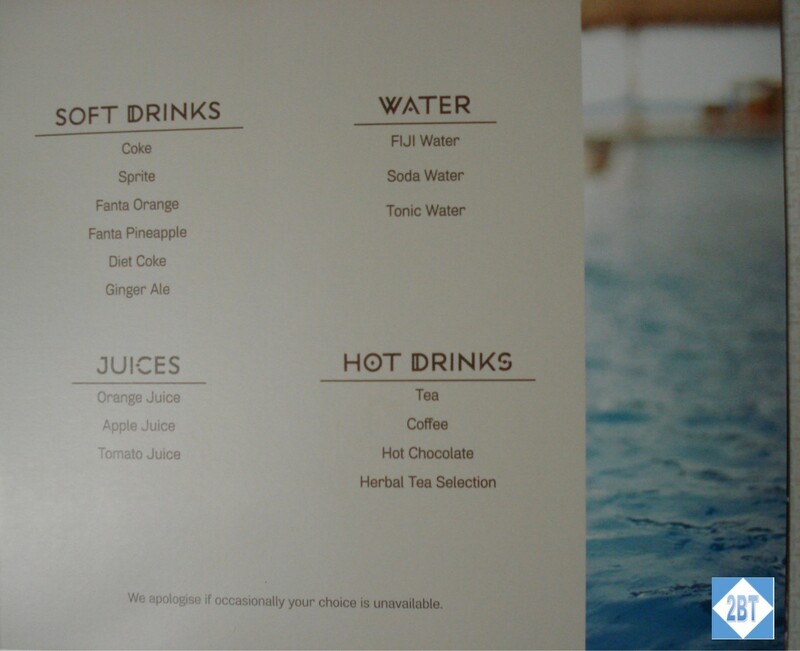 We could choose from three types of juice and a couple of sparkling drinks. 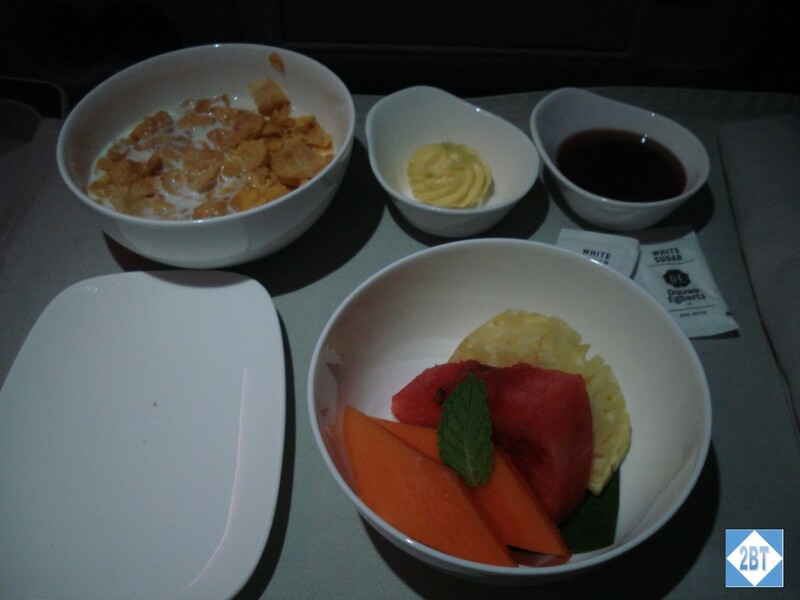 To start there were two choices of yogurt and we could order fresh fruit. Two types of cereal were available along with full, low-fat and soy mile. We also put in an order for how many packets of sugar or sweetener we wanted. From the bakery, croissants were available as was two types of toast. 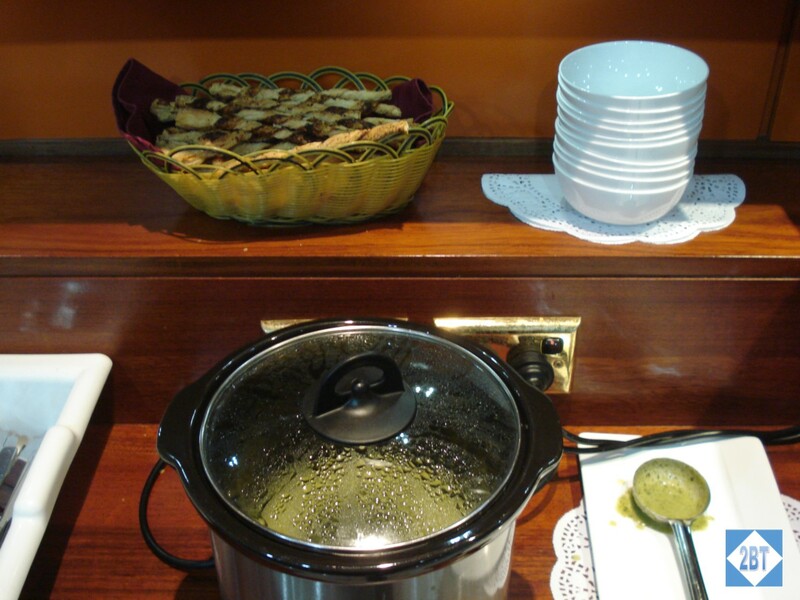 The usual coffee, tea and hot chocolate choices were available along with appropriate condiments. 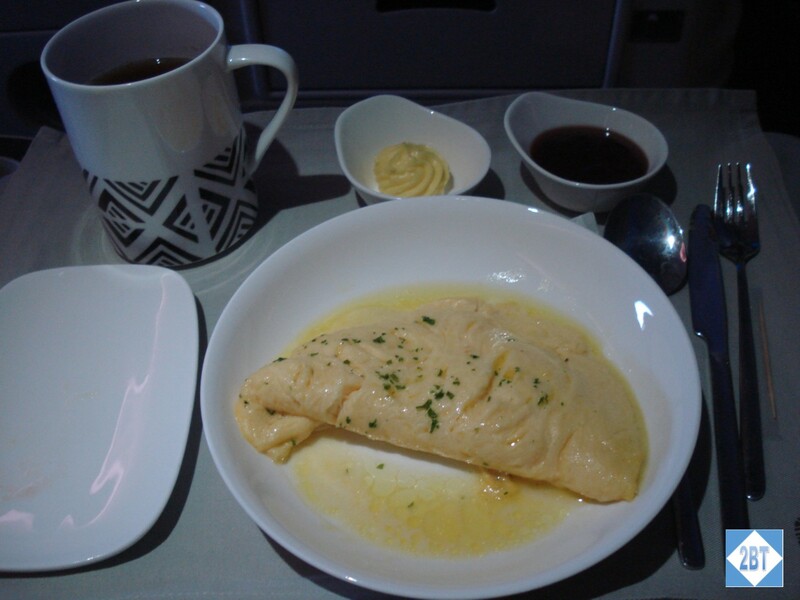 The main course choices consisted of a cheese omelette, braised mushrooms, grilled chicken sausage, sweet potato & hash browns, ratatouille, pork bacon – or the “all of the above” choice. Not being a meat eater at breakfast, I opted for the cereal and fresh fruit, followed by the omelette. The cereal and fruit were fine – kinda hard to mess those up – but I recall the omelette being a bit greasy. I didn’t finish it. But the food served its purpose and kept me from being hungry. Despite our late start, we landed on time in Los Angeles. My business class companion and I both have Global Entry so we zipped through the kiosks and were at the luggage belt before the luggage arrived. since we had plenty of time before our connecting flights, we watched for the bag of our friend who flew in economy so that she was able to go directly to the exit queue. Because it was quite lengthy we said our goodbyes there (she terminated her travel in LA) and went through the much shorter exit lane for Global Entry. From there we were able to load our bags on the belt for our connecting American Airlines flights. After some time in the AAdmirals Club in Terminal 4, we caught our respective flights: my friend to Chicago and me to Dallas. Since I’d arrive in Dallas quite late, I would overnight there before catching my final flight back home. Our two-week adventure was almost over!